Kelley's Dog Blog: #DogWalkingWeek -- OUCH! 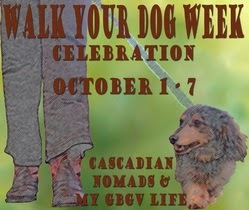 Last week I shared on the Walk Your Dog Week Celebration Hop. I pledged to walk Jedi for at least 15 minutes every day. Did we succeed? No. We walked seven miles for charity over the course of six days -- even walking in the rain -- but on the 7th day I developed trochanteric (hip) bursitis. Again. What is trochanteric bursitis? In layman's terms, it's inflammation of the small, jelly-like sacs, called bursae (singular: bursa), around the hip. (It can also happen in the knee, shoulder, elbow or heel.) 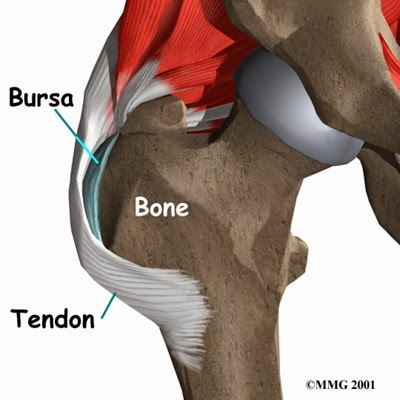 Bursae act as cushions between bone and soft tissue. Injury or repetitive stress (aka overuse) can cause painful inflammation. All my research indicates that trochanteric bursitis is more prevalent in older, overweight, out-of-shape women (like me). My experience says it hurts like crazy! Ice, rest, anti-inflammatory meds and/or steroids help. There are also stretching exercises that can help prevent it, as well as losing weight and getting into shape. But for now Jedi and I have put away the walking shoes. Son has been taking him for short runs and Hubby has been throwing the ball in the back yard so Jedi is still getting some exercise. I've tried to break out a few puzzle toys to work his brain some too. (A bored Jedi is a bad Jedi.) Meanwhile, I'm laid up on the couch trying not to move. No walking, no celebrating, no hopping. P.S. Don't worry about us, we'll be out walking again soon enough! The weather is slowly cooling down and I'm looking forward to after dinner strolls.